Press Interview in Iran 1959-11-01 | Ismaili.NET - Heritage F.I.E.L.D. 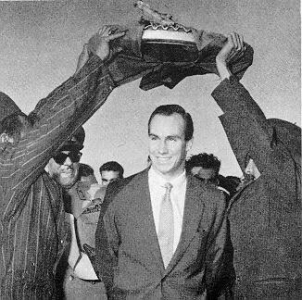 His Royal Highness Prince Karim Aga Khan Imam-e-Zaman, visited Iran on 24-10-59. During the ten days stay, he went to Tehran, Isfahan, Birjand and Shiraz and met thousands of Ismailis who had come to these places from every nook and corner of Iran. This was his first visit to this land where his ancestors lived for about 750 years from the beginning of the 12th century to the middle of the 19th century. His Royal Highness has ancient connections with Iran. His great-great grandfather Imam Shah Hassanali Shah Aga Khan I was the son-in-law of the famous King of Iran Fatehali Shah. During this visit, more than once, the present ShahinShah and his His Royal Highness met and talked for long. On 1st November, there took place a Press Conference at the Officers Club where press reporters asked questions to which His Royal Highness was pleased to answer. A reporter asked him about the probability of his marriage with an Iranian girl. He replied that he had not confronted so far any Iranian girl in Iran or abroad. “I discount the news of my marriage with an Iranian girl that has been published by a French magazine. This news emanate merely from the fantastic ideas of magazine. I shall announce such a decision personally.” His Royal Highness declared. He then said that he is going from Tehran to Switzerland and afterwards to America. He explained that so far, he had visited Syria, Zanzibar, Egypt, Somalia, Lebanon and many other countries where the followers of the Ismaili sect are staying and he must visit the other countries too. Ending his Press Conference, His Royal Highness Prince Karim Aga Khan said he had given £50,000 (fifty thousand pounds) that is, about 10 million Rials to the Tehran University so that they may construct a building for the residence of the students who come from the interior of provinces to Tehran for study, and to spend the remaining amount for giving scholarships to these students. “Meanwhile, I shall give an annual sum of £2000 – two thousand pounds to the Red Lion and Sun Society of Iran in the coming five years. When I graduated from Harvard University, I created 40 scholarships under the supervision of the President of Harvard University for the benefit of Muslim students who desire to study in this University. The Iranian students can also take advantage of this scholarship. The scholarship shall begin early in the academic year and the students can study in any branch they may choose."